please be poolside for a photo on Mon 25th Feb at 6.30pm. Please bring any medals/trophies won. Well done everyone. Great swimming. Big performances. Full round up coming soon. Stay tuned. Please see the new timetable by clicking on the link below. the start of your training session. Well done to all of our swimmers who took part. Great performances! One more weekend to go. Stay focused. Coach Matt for advice on which to enter if unsure. Check out upcoming galas in 2019. It's a provisional list so there may be changes. Penzance is hosting the County Championships on Saturday 9 Feb (Sessions 7 and 8). We need some volunteers for various duties on the day. If you can help, please visit the club desk on a Monday or Friday evening. distance events. Well done girls. The CCASA County Intermediate gala takes place on 16th and 17th March. There are 6 sessions in total. Sessions 1-3 in Penzance on 16 March. Sessions 4-6 in Bodmin on 17 March. times (UCOTs) as well as Qualifying Times (QTs). Eligibility report to follow. County Championships started on Sat 12 Jan at Penzance (session 1). Well done to the Penzance swimmers who took part! A total of 10 sessions (at PZ and Bodmin) take place until Sun 10 Feb.
See Entry pack for details, start times and locations. Pictured left with their shield are our amazing Kernow 2018 Diddy League Champions. The younger swimmers from the club pulled off a hat trick of wins gaining them their recent coveted title. 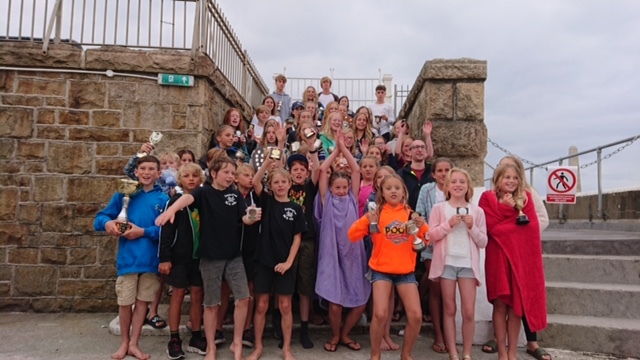 This is the first time Penzance has ever won this prized competition and they certainly pulled it off in style with some incredible swims both in individual and relay races. Congratulations to each and every swimmer who competed in the heats over the last three months, all of your combined efforts made a big difference to the end result. Well done! Attending the Diddy galas but missing from the photo are Alex and Benjamin Dawson, May Sidwell, May Luckhurst, Samuel Buller and Amy Mullins. Pictured left are some of the clubs swimmers who competed at the Plymouth Leander Christmas Meet on 1-2 December at Plymouth Life Centre. Missing from the photo are Alex and Benjamin Dawson, Lucia Davy, Dylan Cole, Emily Stevens and Lucy Evans. It was a fun gala with tree-shaped medals, officials in Santa hats and Christmas music playing! There was even an inflatable race and best of all our Junior team won a trophy on their flamingo! Pictured left are some of the club's younger swimmers who took part in the CCASA Development Gala held at Bodmin Leisure Centre. Also taking part (not in the photo) were Ted Kullich, Robyn Kelly and May Sidwell. Amazing swimming and lots of medals won, well done to all who competed. Please note, the initial results were amended - the final results are in the link below. PBs and medals at Bodmin gala! the club and not only gained new PBs but also managed to win a selection of medals! PZ girls go to town in London - great swimming! Club swimmers Charlotte Bell, Isabella Davy, Melodie Roberts and Amber Sanders represented Mounts Bay Academy by qualifying to swim in the 4 x 50m Freestyle race at the National 2018 ESSA Secondary Schools Swimming Championships held on Saturday the 17th of November at the London Olympic Aquatic Centre in Stratford. The girls swam a phenomenal race and amazingly made the reserves for the final! Having entered this year's schools gala in 20th position and swimming against girls in some cases two years older then them, they eventually were placed a very respectable 12th in the country! Well done girls you smashed it!!!! We're delighted to announce the appointment of Matt Hill as our Head Coach. He's already taken a few sessions at the pool and is getting to know our swimmers. Please say hello if you see him and make him feel welcome. More details about Matt to follow soon. club - so we're delighted he's stepping back into the role. Second victory in a row for Penzance Diddy Team! of the Kernow Diddy League gala held at Carn Brea. A massive well done to all, fantastic team effort! Winter Regional Championships in Millfield recently. Isabella won her heat and gained a new Freestyle PB. and personal best times gained. Please note, the County Championship start on Saturday 12th January in Penzance (800m free). There are a total of 10 sessions over 4 weekends in Penzance and Bodmin. Please click on Entry Pack for details and qualifying times. County Championships will be the Carn Brea and Helston Winter Meet in Penzance on 15 December. who took part in the Diddy Gala at Truro on Sunday 14th October. big thank you to Joanne! Need advice about entering a gala? For up-to-date information about your swimmer, including times, gala entries and membership, please make sure you use Swim Club Manager. They can check we have the correct contact email address, send you your log in details and get you started. In order to receive 10% discount, use the code PENZANCE10 at the checkout. Save 40%on your kit with TYR! Awards Evening: Back in June, the Penzance Swimming Club Championships were held at Penzance Leisure Centre, over four evenings of exciting competition. Swimmers were able to compete in a maximum of 16 events with points awarded according to swimmers’ finishing positions. The age group winners were the swimmers who accumulated the most points. More recently, the swimmers received their trophies and medals at the club presentation evening, held at the Jubilee Pool. Awards were given to the top six swimmers in each age group by head coach, James Ryan. This was James’ last awards evening as he will soon be embarking on a new adventure, starting in September. James will be greatly missed by everyone at the club; and we would like to thank him for his massive contribution to the development of swimming at Penzance. We wish James all the best for his new venture. 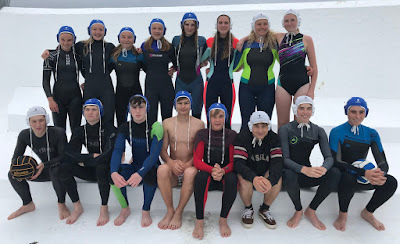 Penzance water polo recently played hosts to Devonport, in an under 15 and under 18 mixed teams. The visitors won both games narrowly 11-5 and 12-11. The matches were very exciting, and both Penzance teams provided strong opposition to the vastly more experienced Devonians. Congratulations to all of the swimmers who competed in Round 2 of the Cornwall & Devon Summer Swimming League recently held at the Plymouth Life Centre. A fantastic team effort, well done everyone! 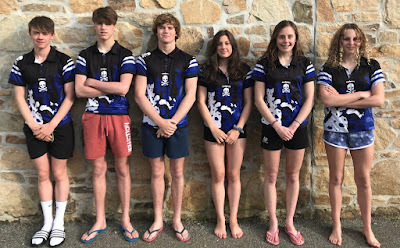 Five members of Penzance Swimming Club went up to Bodmin last weekend for the Newquay Cormorants Level 3 Open Meet Gala. The team had a fantastic day with some podium positions and many brilliant personal best times. Olivia and Lucia also made it into the finals. Olivia came 4th in 50m Breaststroke and Lucia came 6th in the 200m Backstroke. Well done to Olivia, Lucia, Molly, Isla and Lottie! Great swimming! During the final weekend of the South West Regional Championships, three Penzance swimmers competed at Millfield. Dominic Butterfield (50 Butterfly and 50 Backstroke), Lexie Frost (50 Breaststroke) and Maddie Walker (50 and 100 Breaststroke) all competed and swam fantastic races, gaining some personal best times. Well done! With regard to the GDPR - As a club and as agreed in our Risk Assessment only certain appointed members of the swimming club have access to members personal details and members are only contacted for the purpose of swimming matters. 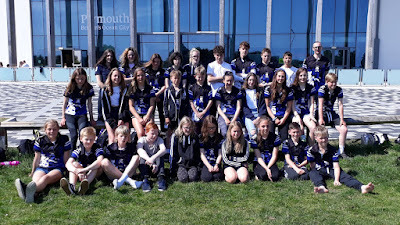 Last weekend, seven Penzance swimmers swam the the South West Youth Regional Championships held at the Plymouth Life Centre. Isabella Davy, Molly Haines, Connor Keeler, Melody Roberts, Aaron Stevens, Fletcher Stevenson and Murray Stevenson all managed to qualify and swam some great swims on the day cementing them as some of the best swimmers in the South West in their respective age groups! A special mention to Melody Roberts who made the finals of the 16 year old 100 Freestyle and 100 Butterfly finishing 8th in both! Great performances all around. Well done to all swimmers!